The Millennium Institute (MI) is pleased to announce the release of Version 1.2 of the Integrated Sustainable Development Goals planning model (iSDG). 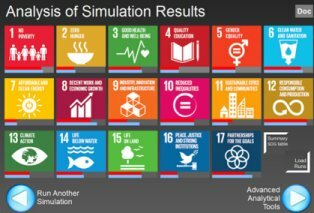 The iSDG is a comprehensive simulation tool developed with Vensim that generates country-specific development scenarios to show the implications of policy interventions on a country’s progress towards the SDGs. A total of 78 SDG indicators (or relevant proxies) are covered. A new set of advanced tools to deepen simulation results analysis. Several new policy interventions that can be simulated in isolation or in conjunction with other policies. A Synergy Assessment Tool that shows the contribution of a policy intervention to the change observed in any SDG indicator and any synergistic effects resulting from interactions with other interventions. The model can be downloaded at http://goo.gl/Kc9B89 or visit www.isdgs.org for more.